Above is an image of the first memory dress I made. 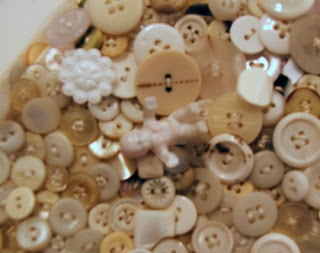 I bought the doll gown at an antiques/junk shop and covered most of the surface with buttons. 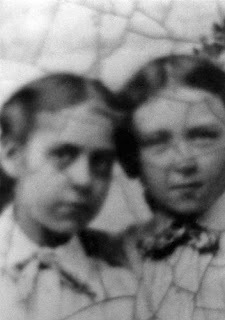 I attached a few trinkets to the gown - a doll arm, a cherub head, a small plastic King Cake baby, and a tiny 19th century tintype of two girls. 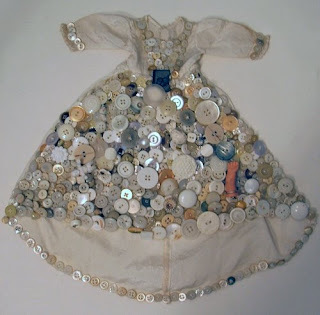 I used the doll dress as a substitute for the female body and the materials helped to convey the ideas of the past, girlhood, and passing down traditional female gender roles. 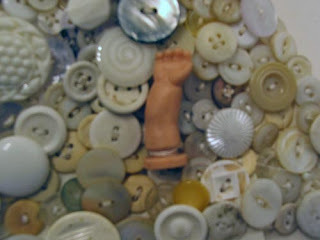 The idea for encrusting the surface of the doll dress with buttons and trinkets came from seeing and being drawn to memory jugs/jars.